A bus accident in Turkey's Eskisehir province killed 11 people and injured 44 people. The accident happened on Saturday when the bus was moving from Ankara to the western city of Bushra on Saturday. The tourist bus owned by Kartallar's Gezi Farm hit the bus with several trees adjacent to the Eskisehir-Bursha Highway. Some reports are said to have killed 13 people. 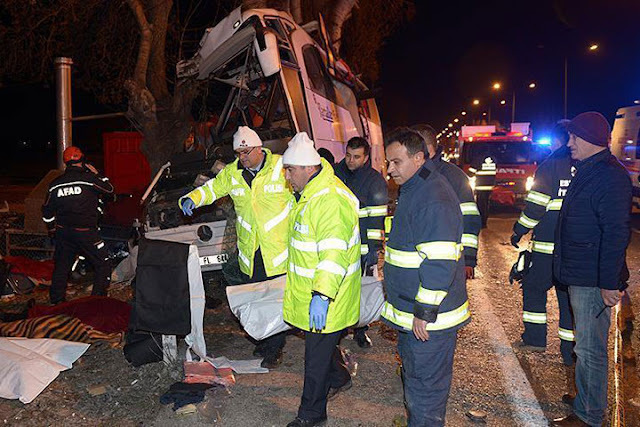 However, Sakashak, the governor of Eskisehir, said that 11 people were killed in the accident. He told the media that the injured were being provided medical services in three different hospitals. Our people who died, Allah will make the inhabitants of Paradise. And those who are injured, heal quickly. He further said, the investigation is being investigated. The bus driver and his assistant were detained. According to a report published in the Middle East-based media Al-Arabia, the bus driver said that there is a dog in front of him that he has changed the direction of this incident.